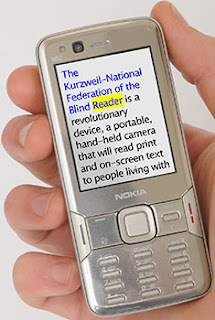 K-NFB Reading Technology has announced that their reading software for the blind is now available for the Nokia N82 mobile phone. The software is called the knfbREADER Mobile. This would truly revolutionized the way blind and visually impaired people interact with their environment. According to the press release, users can actually take pictures of printed materials and it would be read to them while visually impaired users can enlarge and highlight printed materials using the phone's display. The software includes Kurzweil's intelligent image processing software to that images captured on the Nokia N82 would be further enhanced so it can be easily converted to text to be read by the software. Ability to read from books, articles, labels, including bills and memos. Can navigate text by sentence, word, or character.